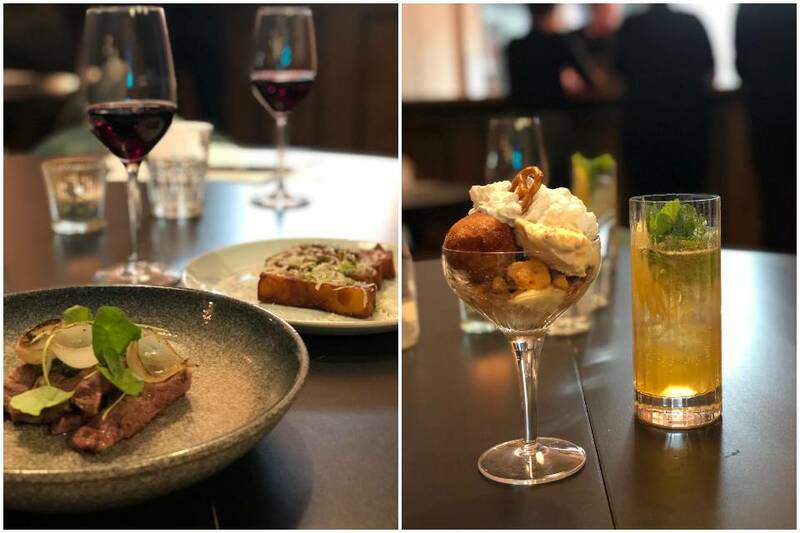 ‘Anti Fine Dining’ is set to be the newest trend taking restaurants by storm by the looks of things and Dough Leeds seems to be one of its pioneers. 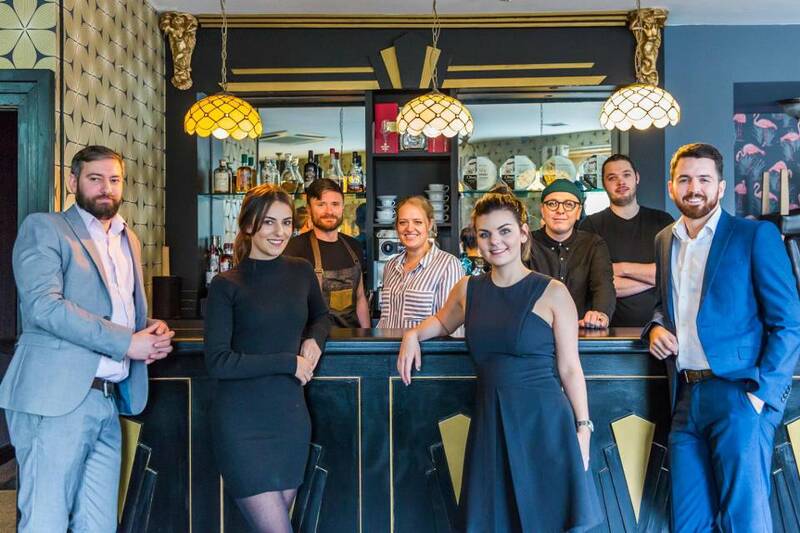 A ‘modern pub’ located under its sister venue, Vice and Virtue, is set to be Leeds’ newest form of relaxed dining, whilst still maintaining the high standards of the Vice Group. Expect brunch, lunch, dinner and Sunday roast. We were recently invited to the launch of Dough a few days before it’s opening, so the venue itself wasn’t entirely ready for a viewing. However, we did manage to catch a glimpse of it on the way up to Vice and were very impressed. Upstairs in the newly refurbed Vice, which can only be accessed through Dough, I was welcomed by the ever-charming Pete Hayes. Pete has experience working in Dakota, Hedonist and a few other well-known Leeds establishments. We briefly chatted as he walked to my table, where Simon Tate brought over my first drink. Simon has had over 5 years’ experience working in Shears Yard, among a few other fine Leeds’ bars, and wrote cocktail menus there. Combined with Claire Morrow, who had recently won several cocktail competitions and worked at the Domino. The team at Dough Leeds so far seemed more impressive than the menu! Head Chef, Jonathan Hawthorne is known for his own fine dining brand, Xo Supper Club and has experience working at the Man Behind the Curtain, and most recently his current role at Feed, part of the Vice group. He talked about the hard work they’d all put in, and the extensive hours it had taken to build Dough. I could tell they’d all invested a great deal as it showed, whether it was through how tired they looked and how delicious the menu looked. The first drink was a ‘Poppy Fizz’, poppy liquor, citrus vodka, lemon and prosecco. As welcoming as the staff and a perfect ice breaker at the table. To start, we had the ‘Samosa’. Chicken bhuna, dairylea and mint yoghurt, all homemade of course. Paired well with London Fields ‘Hopster’ pale ale. You always expect to see a gallon of grease when it comes to samosas, but they somehow managed to avoid that and produce the pastry with so much flavour, I secretly asked for one more on the way out. Expect enough flavour and spices to take you to India. The second dish we had was the ‘Fried chicken’. 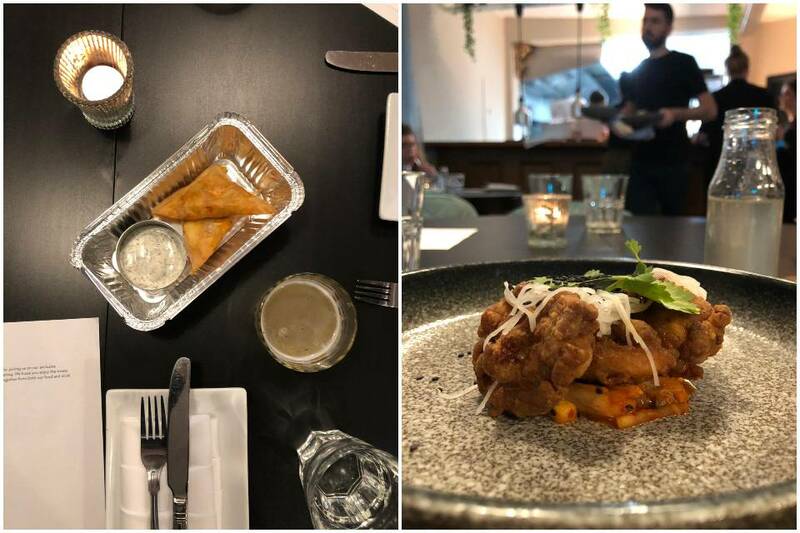 Whilst everyone in Leeds seem to be doing it, Dough have managed to create a very tender and flavoursome chicken, accompanied with fermented pineapple, kimchi and pickled mooli. If you’re not a pineapple person, don’t worry about this. It’s not a Hawaiian pizza and you will still love it regardless. Paired with their ‘Aunt Phylis’ cocktail. Vanilla vodka, coconut oil liquor, grapefruit tonic and a homemade mango cordial. The third and fourth dishes pretty much brought a smile onto everyone’s face. Smoked Flank, roast onion petals, chimichurri together with the Dauphinois potatoes, gremolata, parmesan and pepitas. The steak was perfectly cooked, tender and with the Dauphinois, which were actually whiskey barrel smoked chips with melted parmesan and pepitas on top. Paired with their house Malbec, it went down a beautiful treat. Lastly, the dessert. The tastiest dish on the menu most certainly deserves its own paragraph, so here it goes. The ‘Dough Ice Cream Sundae’ consisted of peanut butter, jam sponge, banana custard, banana fritter, doughnut, burnt marshmallow, raspberry ripple ice cream and chocolate sauce. Paired with a ‘Yorkshire Iced Tea’ cocktail of Beefeater gin, Yorkshire tea syrup, cocchi Americano and soda. Being a lover of all kinds of dessert and cocktails, I would actually just visit Dough Leeds for these.